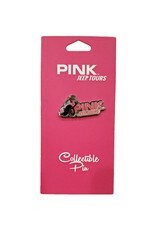 Die-cut Pink Jeep Tours collectible pin. Product dimensions 1.25 inches x 0.5 inches. Small parts. Not for children under 3 years.